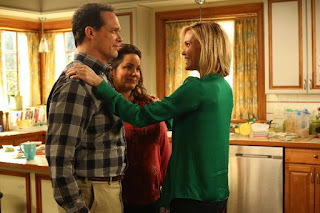 Tonight on American Housewife, Katie intervenes in Viv's marriage, and it doesn't go well for her. Greg tries to get Taylor and Oliver to close the cabinets, and they don't listen to him. Katie tells him to not do the things for them, or they won't listen. He threatens to take away their allowance but they do not care. When he runs into something because of them again, Greg takes desert away. And they still don't care. The cabinets are open again, and he unplugs their Xbox. They get upset, and he tells them to close the cabinets and go to their rooms. He also puts them in charge of putting Anna-Kat to bed. This was a pretty good episode, but not one of the best of the season. The Taylor and Oliver story wasn't all that funny or interesting, and Anna-Kat didn't really get much attention this week. Katie's story with Viv was the best part of the episode, but even that one wasn't as good as most Katie stories.